The Guardian’s article about natural, organic and biodynamic wines with its slew of missionary purists reminded me of a series of photos I took in March at the Jean-René Germanier winery in Vetroz. The best Swiss wineries are trying ancient, older and new methods and combinations of all of these to ensure they are producing top quality wines, and Germanier is a fine example of this. When I talk to the producers about experimenting, they all mention their efforts with organic and some with biodynamic approaches, and they are remarkably good about sharing their experience with other wineries. Some are certified organic and for any number of good reasons others have decided not to go that route, but they are virtually organic or some of their wines are produced this way and not others. Philippe and Veronica Mettaz in Fully, for example, make it clear on their web site that some of their vine parcels are being “reconverted” to biodynamic, and they tell you which wines comes from these areas. They and Patrick Regamey’s Cave Histoire d'Enfer above Sierre are part of a small group of Valais wineries who banded together this spring to offer a tasting of their highly touted wines that are close to but not quite organic, by choice. What impresses me, over and over, is the focus on quality, on quietly listening to their wines rather than following a noisy market trend – if wineries elsewhere are now into organic, this doesn’t surprise them, but it’s not why they are doing it. Germanier is one of Switzerland’s larger private wineries; it produces wines that are well known at home and abroad: its international reputation was made when its Syrah "Cayas" came out of nowhere to win top honours at the Paris Vinalies competition some 20 years ago, and the wine has been a bestseller since. It has become a standard setter for what I call the North-of-north Rhone wines, the Syrahs produced on the northern tip of Lake Geneva and in Valais. Germanier’s beautiful golden late-harvest Amigne grape “Mitis” has a strong following abroad as well as at home, the perfect wine to end a special meal. 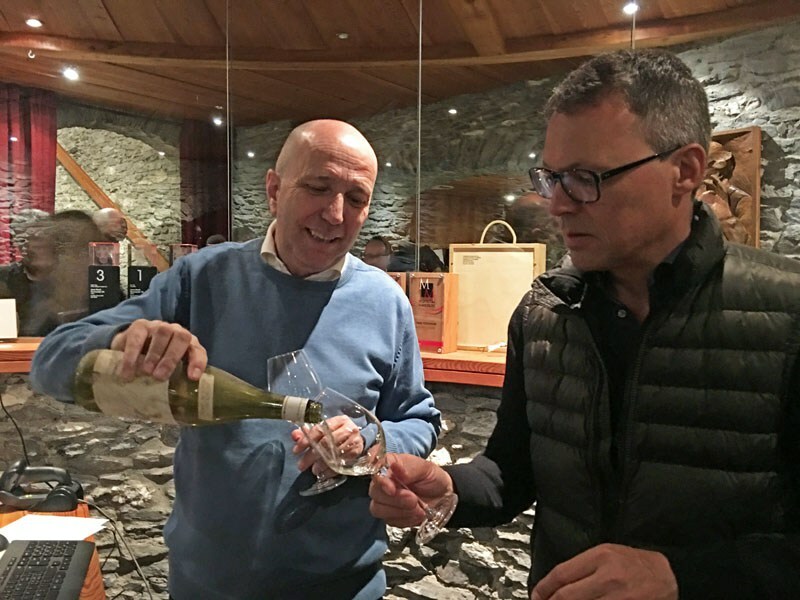 The winery has a large wine list, including three organic wines, with other vine parcels in transition, Gilles Besse, oenologist (and former president of Swiss Wine Promotion) tells me. A visit to the recently redone wine cellar with several wine producers, members of the Mémoire des Vins Suisses group, prompted some teasing that they can afford the panoply of new cement eggs and oak barrels and various sizes of stainless steel tanks, which smaller wineries can only dream of – and yet interest was strong in details of how the cutting edge winery works. For me, the beauty of the barrel room was nearly enough, but sometimes the beauty is in the detail and in this case it was seeing how the railings in the tanks room double up to carry water. True, not every winery can do this, but Germanier offers a fine example of the endless search for ways to improve wine, with Swiss efficiency, cleanliness and quality at work.